A MIAMI EREV CHANUKAH CELEBRATION! Motzei Shabbos Dec. 5, 745pm @ The Millineum Master Theater in Brooklyn. Coming off their latest hit album UT UT, Yerachmiel Begun & the Miami Boys Choir are coming to Brooklyn Chanukah time, for the first time in 17 years! This show will be on the night BEFORE Chanukah begins, and so it promises to be a rousing simcha & celebration entering into Chanukah. 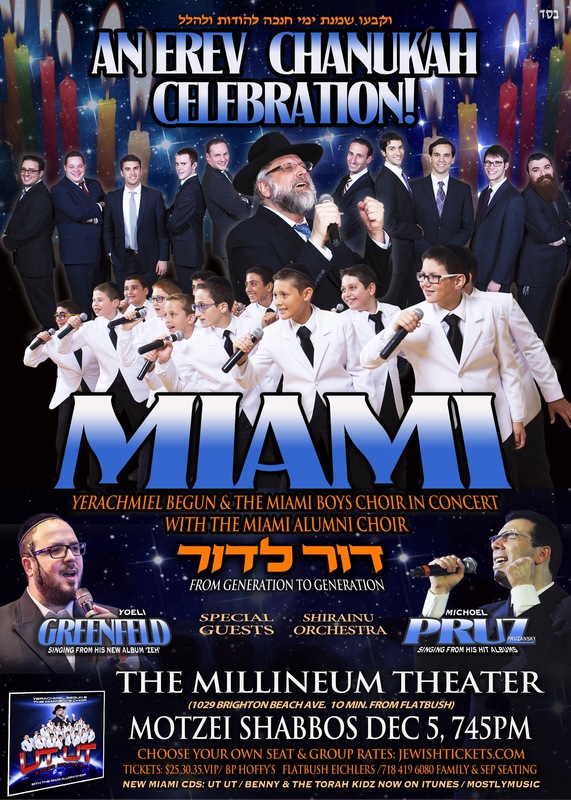 Joining MBC and performing on their own will be the highly acclaimed Miami Alumni Choir, who appeared on the new album, at the MIAMI 36 show, and other performances. Also Starring Yoeli Greenfeld (who is releasing in a few days his new Album ‘ZEH’), as well as Michoel Pruzansky singing from his hit albums. With surprise Special Guest stars, all accompanied by the Shirainu Orchestra. WIth Gal Gershovsky, Shai Bachar, Jim Hynes & the full ensemble. To top it off there will be the full stage LED screen video for an amazing audio visual experience. Tickets will be in great demand, and there is ONE SHOW ONLY! So get your tickets now at Jewishtickets.com & choose your own seat there as well. tickets are $25,30,35, VIP. For groups sales go to the website or call 718 419 6080. Family & separate setting available.